I hope you will join me in welcoming Lynn to Frugal Family Fun Blog for this gem of a guest post with lots of valuable money-saving tips. Thank you, Lynn! Update: We have a guest post up on Lynn’s blog today. Be sure to visit her! Hi. I’m Lynn, mom to a 2 year old lover of books, and I blog over at Chronicle of an Infant Bibliophile, where we record and review everything my son reads. We’re delighted to be guest posting at Frugal Family Fun today. When it comes to frugal, and fun, it’s hard to beat your public library. While visiting the library and borrowing books is wonderful, there is also a certain joy in owning your own books. That’s where the subject of today’s post comes in — getting the most out of library book sales. As a child, I remember descending the stairs of my local library once a year, entering a small room jam-packed from floor to ceiling with books and eager patrons elbowing each other for the best selections. The excitement was palpable. My mother would buy me a brown paper bag for a set price and set me loose to fill it. I was in heaven. Now I am fortunate enough to live in a city with a huge public library that holds book sales multiple times per year. Fresh from our most recent sale this week, I am sharing 10 tips for getting the most bang for your buck out of library book sales. Our focus is on children’s books, but many of these apply to all types of books. 1. Go early. When they’re gone, they’re gone, and the best selection will be in the opening hours. If you are a Friend of the Library (my husband signed our family up as a stocking stuffer last year for $25), check to see if there are free members-only preview sales the night before. 2. Volunteer. If you really want first dibs, sign up to volunteer for the sale. I don’t know what the official rules are about snagging books for yourself when you volunteer, but in the last city I lived in, the crafts section was always completely empty, and those kindly older women working the checkout line looked mighty smug about it. 3. Set a budget. This is fairly obvious, although admittedly, I don’t usually do it. It might work especially well if you have older children with you. Give them each $5 (or less, depending on how much books cost) and let them figure out what they can buy. 4. Go late. Check with the library about the last few days of the sale. Prices might be cut in half, or the fill-a-bag sale might only be brought in on the last day. I know I also recommended going early. It’s a trade-off between greater availability and the best bargains. Last year, I found that I was struggling to fill an inexpensive bag with books we really didn’t want on the last day, so I limited myself to the first day of the sale this year. 5. Be neighborly. This tip makes the whole experience more fun. At large sales, ask others around you if they’re searching for a particular topic and ask them to let you know if they see what you’re looking for. If you feel weird asking, you can also just express your thoughts loudly to your young child: “I hope we can find you some books about cars!” This inadvertently scored us four great finds last week. 6. Choose wisely. Check board books for chewed corners (my personal peeve, which eliminates most board books at the sale), and especially every page in pop-up and lift-the-flap books for missing sections. If you see a book in great condition by an author you know and love, don’t waste time reading it — toss it in your bag and move along. It’s a keeper. 8. Go through all of your selections one last time before you buy. Ask yourself if you really want to own the book or if you’d be content to borrow it from the library. 9. If you get a book home and realize that you don’t like it, fear not. Use sites like paperbackswap.com or bookmooch.com to trade for other books that you would enjoy more. I suspect many use the big book sales expressly to get books for trading online. I don’t have that kind of drive, but you can use it selectively for books that you change your mind about once you get them home. Personally, we pop them right back into the library donation bin. 10. Feel good — your purchase is helping to keep our libraries running! We go to the library at least twice a week and yet I have never been to one of the library book sales. I'm going to make a point to go next time. I promise! Thanks for the tips. 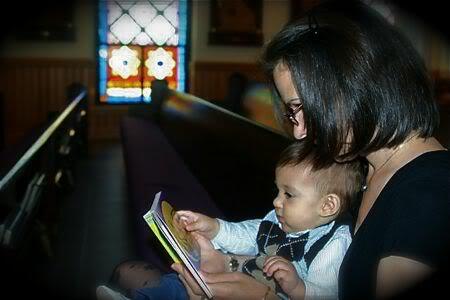 I love Chronicles of an Infant Bibliophile too – one of my favorite blogs! Thanks Valerie – that was fun! (Come over to our blog to see Valerie's post on our blog today too). This was a long post and I didn't read it very carefully. How come our children look so different? Great tips, maybe I'll brave our library's next book sale with my three children. @ Christy — There is one library near us that has a book sale room year round. It's fabulous! I've bought magazines, books, and DVDs from there, and some of them I've used with our homeschool curriculum. It's about one tenth of the retail price! @ Infant Bibliophile — Thank you again for such a wonderful and informative post! Since both of the girls are a little under the weather today, it was perfect timing. We love your blog — what a great resource! @ Mark — What have you been feeding them? Clara's hair became really short, and Emily has disappeared! @ maryanne — That sounds serious! Do you have a back up plan? @ Ivy — I have trouble remembering specific dates/times of the sale. I found it to be a lot easier when I set up an automatic reminder, then I almost always make the trip over. It's well worth it! I totally forgot to mention DVDs and CDs – had it on my list! We usually don't shop for them there, so it slipped my mind. I did get a neat DVD about learning Spanish there last time. I should look at the DVDs again next time now that our son is getting old enough to enjoy them. Hi Lynn! Great advice! !Our elementary school library has discards which are sometimes older books from the 40's and 50's and the stories in them can be wonderful and the artwork like old etchingsand prints are inspiring for me. Last night we read a story called Wave Child from a collection of discards. My kids LOVED it 🙂 Thanks for introducing us to Frugal Family, a new fave mom blogger!! And hehe Mark's comment and your comment back to him cracks me up! @ Kim — Oh, I do love the idea of using vintage artwork from old books for home decor! Those illustrations are positively charming. @ Erin — No book sales at your library? Oh dear, that is sad. Do you have used book stores in your area? They can be a real treasure trove. Really great tips. I am looking for the same from many days. Thanks for sharing information with us.